Fire Hydrants | Adams Fire Tech (Pvt) Ltd. There are different types of Fire Hydrant Valve like Double Headed Hydrant Valve, Screw Type Hydrant Valve and Single Headed Hydrant Valves. In Fire Hydrant System main keypart is Fire Hydrant Valves. Hose Reel are installed in Hose Box and that Hose Reel is directly connected to Fire Hydrants. When something happen and someone open Fire Hydrant Valve, water comes out with fully force. Sometimes in big industrial setup, permanent Fire Stand Post also used to fight against fire. There are main two types of metal in which Fire Hydrant Valves available is bronze and brase. Adams Fire Tech sees hydrants as a critical fire fighting product, which needs to serve its purpose without fail. Designed built and tested for dependability, Adams Fire Tech has UL/FM hydrant model SF-F-06 provides smooth and optimum performance with highest quality. Adams Fire Tech fire hydrants are generally made in cast iron and in ductile iron too as per customer’s demand. 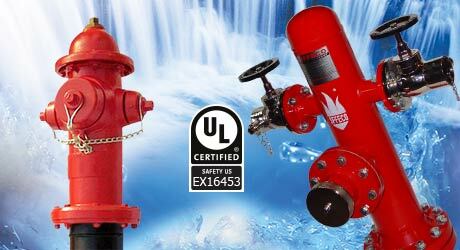 Adams Fire Tech Fire Hydrants are used in commercial centers, colleges, hospitals, shopping malls, etc. Adams Fire Tech Fire Hydrants, which are designed to be weatherproof, are normally equipped with hoses, hose nozzles, hydrant wrenches, spanner wrenches, fie axes, and flashing light, torch, etc as per customer’s requirements.